At 07:00 hours on Saturday 22nd September a Team of HARS radio amateurs arrived at the Headquarters of the Nene Valley Railway (NVR) at Wansford Station, Peterborough to set up and operate for the Railways on the Air (ROTA) weekend. 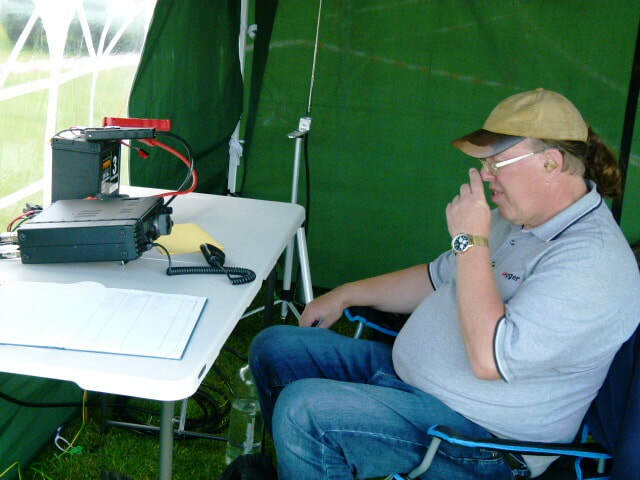 Once we had set up the full sized G5RV antenna and gazebo in the car park and connected the Icom IC-7200 radio we were ready to start operating the callsign; our first QSO was at 08.28 hours with Mike G0NEV down on the south coast with a signal report 5 and 9 both ways – the kit all worked! As a Team we continued throughout the day changing operators and loggers when required and gently completed the third page by 14:24 hours, with the final page for the day being competed with a QSO through Chris G8GWK before closing down the station at 16:30 hours. During the planning meeting prior to the event we had decide to only put the station on for the Saturday this being due to the heavy rain and stormy winds predicted on the Sunday however having carried out a review we all decided that on Sunday the weather forecast had greatly improved so we would all return to operate again, we administered some additional lashings eternally and internally to the gazebo so that it remained in the car park and not some tree that surrounded the carpark! A count up of the logbook revealed we had worked 101 QSO’s, 11 of the being ROTA stations, 1 Museum (Duxford), 1 SES (Marconi) and a handful of European stations – operating conditions had been good for us. On the Sunday we arrive a little later than the Saturday as most of the station was still setup from the previous day we found it serviceable and we were soon operating from 09:07 with the first QSO logged for the day with Mario OR4KW 5 and 7 both ways with others calling into the station once a spot had been logged onto DXHEAT website. Occasional CQ calls were put out with replying stations returning and at times we had to control the pile ups that we experienced. Our final tally for the day was 105 QSO’s, 9 of them Railways and for the first time that the team can remember we had logged a QSO from George 2J0GUR over in Jersey. Operating conditions had been good for us during the operating period with only occasional QSB effecting our QSO’s. During the weekend we ran solely on 12v Leisure batteries (75 and 120 Amp) these gave us ample power to our IC -7200 putting out 100 watts as there was no mains power nearby; if you have to operate remotely like we did we can recommend this battery as it stands up to this type of use and lasts the period of operating. To conclude we had 206 QSO’s with 20 Railways which made an enjoyable weekend along with plenty of Team banter, tea, coffee and of course bacon rolls and cake from the Railway Cafe! Over the weekend you may have experienced during QSO’s the occasional toot or whistle or clang-clang sound from the 60163 Tornado Class A1 Locomotive in the background as she was running up and down from Wansford to Peterborough station after being repaired in the workshop; the locomotive came to a stop just south of Sandy, Beds with a broken combination lever, investigations had revealed that this was due to the middle piston valve overheating and binding in the valve chest causing some parts to break and make her unserviceable. Tornado had been at Nene Valley since middle of April 18. We also caught site of the 0-6-0T engine No. 1800 Thomas the Tank engine which is also at NVR, others are available around the UK but this is the real one as Rev W Audrey who in 1947 wrote his second book in the Thomas the Tank engine series at the time that the train was built, the author lived just 5 miles south of Wansford. Thanks go to the NVR for accommodating us in their busy car park so that we could run the station over the weekend, also to Club members for their time - Mervyn G4KLE, David M0VTG (Organiser), Steve G1KWF, David M0SKT and for the Sunday morning stint Richard 2E0FRQ. 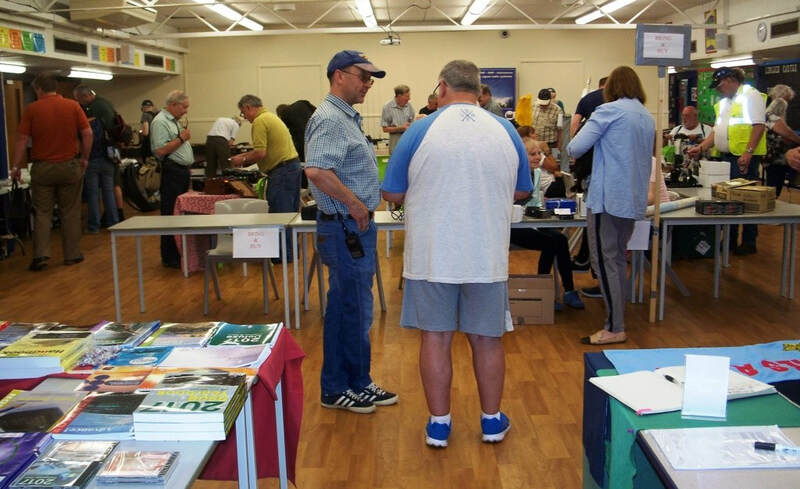 Huntingdonshire Amateur Radio Society set up for our third year at St Mary’s Church, Buckden, Cambridgeshire. We had 11 members of the club turn up throughout the day to either assist in setting up, just visit and operate and then break down the station. The Church Wardens had managed to drop a rope with a pulley from the top of the tower and we secured one end of our G5RV to this and the other end went over a very old and large Oak tree in the church grounds, so our antenna was about 50ft above the ground. Our first contact to test the Antenna and Rig was Mark/KD4D in Huntingtown, Maryland USA, a good test. at the end of play we had had 63 contacts with 21 Churches and Chapels plus two other Special Event stations. On the 1st April this year the Royal Air Force entered it 100 year since its formation this gave the opportunity to put on a Special ‘Special’ event radio station using the callsign GB0WY at RAF Wyton, Cambridgeshire. 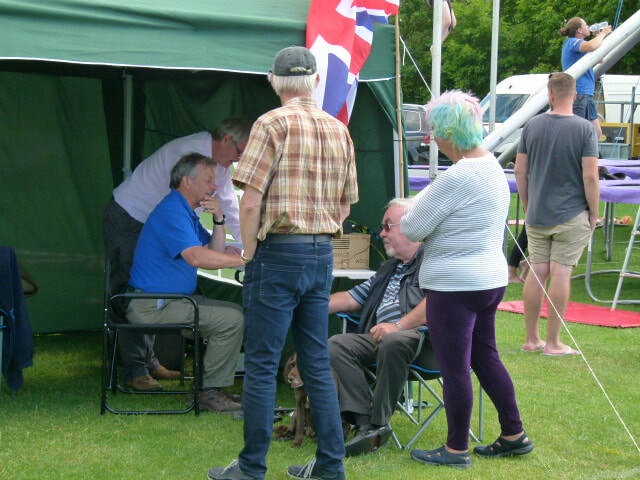 This year marked the fifth year that the event has taken place on the station, it's location and history is always a source of discussion and is popular with radio amateurs who may have worked, visited or flown from RAF Wyton. By utilising Cadets and Staff from local RAF Air Cadet Squadrons and the Event Team from Hunts Hams a suitable radio station was set up using rooms in No 2331 (St Ives) Squadrons Headquarters which used to be the old Station Survival Equipment Flight complete with the brake chute drying tower attached to it. Utilising various club members and cadet staff we all had turns at the microphone during the day with the Cadets having some radio theory and practical sessions interspersed during the day..... nothing to complex or technical for them as they are our future Amateur radio blood and we wanted them to enjoy the experience plus gain some useful knowledge during the day we logged 110 contacts. The 7th April saw day two of operating from RAF Wyton with a re-run of the rigging of the station which all worked very well the weekend before. We were soon on air calling CQ on 80Mtrs and our first contact was G0AWV at 08.55 hours with calls from other UK stations continuing throughout the morning, our first contact in Europe was PA1MV - Japp in Delft, Holland at 11.12 hours. We move onto 40Mtrs after midday working MM6YLM Michelle in the Shetland Isles, not quite DX but well worth working her and her Grandad. Then followed many contacts from Germany, Switzerland, Bavaria, Czech Republic, Croatia, France, Italy and then back into the UK. We also maintained a listening watch for two special callsigns - VP8RAF/100 located at Mount Pleasant Airport, Falkland Islands and ZB2RAF in RAF Gibraltar but due to operating conditions we were unable to make contact with them. During the second day of operation we logged 113 OSO's which made our total of 223 during the event this was helped by the excellent and simple set up of the equipment and the seasoned operators and loggers along with the cadets who attended the event and learnt a lot more about radio communications. 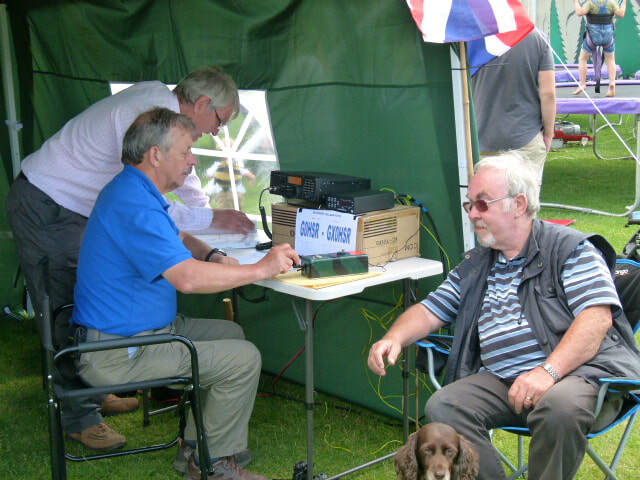 The Huntingdonshire Amateur Radio Society once again this year took part in Railways on the Air as GB0NVR at Wansford Station on the Nene Valley Railway near Peterborough. The NVR management this year invited us onto the main platform where Mervyn G4KLE, David M0VTG, Malcolm M0OLG, and Gerald G8AKL erected our gazebo and antenna on the Friday afternoon. This year ROTA coincided with Thomas the Tank Engine weekend and so we were able to enjoy the look on the children's faces as Thomas came steaming in. Thomas at NVR is, of course, the only true Thomas as the Reverend Audrey the author of the books of our childhood and living as he did in Stilton just 5 or so miles away personally named Thomas at NVR many years ago. Altogether we had contacts with 82 stations, twelve of which were other ROTA stations. The equipment used was the Society's ICOM IC-7200, LDG 100 Pro II, and G5RV at about 20 feet roughly east-west. During the weekend we also watched “92 Squadron” Battle of Britain class 'Spamcan' haul trains to Peterborough while Thomas chuffed his way through the tunnel to Yarwell and back. We were visited again this year by Bishop David (Bishop of Huntingdon) who made a beeline to us, sat down and listened to a contact. The ladies of the church kept us refreshed with tea/coffee and homemade cakes throughout the morning, some came over and asked many questions about Amateur Radio. A Big Thank You to those few who helped set up on the Sunday evening and all those members who put a lot of effort into helping from 7 am Monday morning with Car Parking, Gate Operating, the Bring and Buy stall and just meeting and greeting on behalf of HARS. On Saturday 12th August, 18 members and some Station Managers visited the Radio Display and Mini Museum of 2E0IEG (Marc). A friend brought over an old Airfield Fire Engine called HENRY that Malcolm (alias Henry - M0OLG) sat in to have a play and ring the bell (boys and their toys). You know he is always looking for a new vehicle to go /Mobile. Another outing for HARS, this time to support Buckden Village Hall and their Village Fete. Malcolm (M0OLG) offered us the use of his caravan as our temporary home, so it was decided after a recce in May that we would site ourselves at the back of the museum's main building which gave us enough estate to put up masts and antenna. On Saturday 24th, we all paraded at 08:00hrs to start operating, Steve (G1KWF) had already set up the IC7200 and tested all equipment so we were ready to start. Malcolm made the brew and we had our first contact into Kent at 08:20 on 20m with a report of 5/9+20db – a great start. We also contacted Roger TM53IMW for the second year, who is operating a similar rural museum station from Musée de l'Évolution Agricole, JUVIGNÉ , France. During the weekend of 13 & 14 May Amateurs from (HARS) activated Duloe Tower Mill, Eaton Socon using the callsign Golf Bravo Two Delta Whiskey Mike (GB2DWM). This activation is for the National Mills on the Air weekend which is run every year on or around the second weekend in May. This is an ideal time to promote Amateur radio while helping to preserve some of our heritage, many types of mills take part albeit steam, water or wind. National Mills Weekend is the annual festival of our milling heritage and provides you with a fantastic opportunity to visit mills which we have many locally. Operating from the grounds of the mill by kind permission of the owners we set up our dome tent which provides enough room for two stations to operate comfortably with refreshment and seating area for other club members eager to operate or log calls. We operated on HF and VHF, again this year due to the band conditions HF was somewhat of a challenge at times; however we did manage to log 200 calls into the station this year with contacts from all over the UK, most of the European countries with the best distance contact on the Saturday afternoon into Abu Dhabi in the United Emirates with A61FK, he was running 700 watts into his 6 element beam, not bad at 3461 miles distance, we were running about 80 watts from the Icom IC-7200 into a fullsize G5RV. Seven Mill SES were contacted with eleven QSOs taking place over the period of operation. Sunday was a much quieter day for the station with QSO's taking longer due to the QSB and more interest in the exchange of the stations information, we found that putting the operating frequency onto QRZ.COM helped others locate us in the bands and regularly updating when we looked around the frequencies. Thanks go again to the dedicated team of 12 club members who assisted during the weekend....even if it was only to make the refreshments during change of operator or logger your help is appreciated! Putting up and de-rigging of the station only takes about an hour each time as we have now got it down to a tee. Checkout our events page on the website for the rest of the years SES activity, if any interest you contact the event organiser. Once we were behind the wire on the north of the airfield we got set up reasonably quickly, we had the occasional cry of ‘In Coming’ as Mervyn G4KLE attempted to brake some of the Hanger windows with his catapult and golf ball, seriously he was trying to get a line over the huge hangar door framing so that we could tie off one end of the antenna, he eventually succeeded with the correct amount of twanging! Once back inside we operated a shift system with the usual operators and loggers swapping over from time to time. Due to poor HF conditions we utilised some of the media available to us - QRZ.com, FACBOOK and DX Summit. This enabled the station to advertise our callsign and operating frequency, we felt that this aided to amount of contacts we managed to capture during the day, this gave the team food for thought as this may be a way for our future events... you do need someone with the laptop in front of them so that you can keep a keen eye on the frequency readout and update when required! We operated on the 80, 60, 40 and 20 Mtr bands chasing the propagation and openings where we could. Here is a roundup of the 53 contacts for the day:- 8 on CW – Thanks Clive G3HKQ the CW Master for working his socks off with the straight key even with local QRM in the room! 45 on Phone - team effort here with local stations from the Cambridge area along with stations from Finland, Russia, Turkey, Serbia, Germany, Poland, America, France, Ireland and Wales. Rob - G3FXA, QTH in Kettering remotely operated us from Las Vegas via his Iphone! Sadly only two other Airfields were contacted so unfortunately no chance of a certificate this year for GB0WY! Our set up this year was the Club IC-7200, LDG ATU, a full-sized G5RV mounted onto the portable mast running 100 watts straight out. 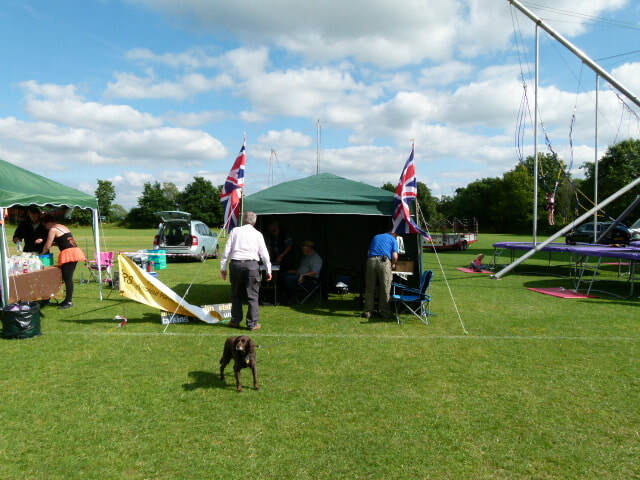 The set up worked well for us and behaved itself all day and was used as a test for the other SES that the Club has planned for 2017, go to http://hunts-hams.weebly.com/future-events.html for further details. Thanks go to M0VTG, G4KLE, G3HKQ, G1KWF, G6LSB and M0JWS for their company and time during the enjoyable day, to HARS for the loan of the equipment for the event and 2E0DIP for organising the event and arranging access to the Station. HARs members tuck into the usual fare of turkey, roast potatoes and a selection of vegtables at the annual HARs Xmas dinner. Chairman David (G7DUI) looks on with interest as Andy shows the end of stage 1 of the construction of a 2m/70cm "Flowerpot" antenna. To the extreme left is a version of the antenna for 4m/70MHz. A very interesting talk was given by Andy G6OHM on the subject of Flowerpot antennas, which he builds and supplies. Any HARs member interested in purchasing one of these antennas should contact Andy directly. The first surprise was that before the presentation there was no computer in sight, despite Andy standing in front of a large pull down projector screen. Andy was able to give the presentation only looking at a few written notes only, and what was impressive was that as he was describing the history of the antenna, he started to build a dual bander 2m and 70cm antenna right in front of the audience, in order to demonstrate how easy it was. You will need about 3m of RG58 coax (MIL spec is recommended as it has a braided screen), a plastic tube of 22mm diameter. Firstly the coax is prepared by stripping back about 1/4 wavelength (at 2m) of plastic covering and outer braid. A 7mm hole is drilled in a specific place on the tube, and the stripped coax is inserted into the tube and the end secured at what becomes the top of the plastic tube. Next to the hole the coax is wound around the plastic tube about 14 times, to act as both a choke and match circuit. Andy had the end of the coax plugged into a MFJ-259 and was able to get to around 1.5 to 1 SWR reading, by simply adjusting the number of turns. He then went ahead an explained that simply by wrapping some aluminium foil around the upper part of the tube of a specific length (235mm), the antenna now would work on 70cm as well as 2m. Adjusting the position of the aluminium sleve up or down changes the portion of the 70cm band which gets the lowest SWR. Andy's commercial antennas used a proper piece of aluminium tubing, rather than the aluminium container from the take-away (which he used in the demonstration), but it was interesting to know just how cheaply this antenna could be made for. Andy is obviously a great "re-purposer", as he explained that a plastic cork from a bottle of wine could be used to make the end of the plastic tubing watertight. Trapping some thin cord or fishing line at this point allows the antenna to be hung from a suitable tree or internal structure such as a curtain rail. Andy continued explaining how the design could be used on 4m (where he found that the diameter of the pipe was quite critical when winding the choke/match), 6m and even 10m (where the choke was wound on quite a large plastic container). The talk completed with questions and answers, before HARs club members showed their appreciation in the usual manner with a hearty round of applause. On Saturday morning we arrived at the church to very different weather conditions, it had been raining all night and it was still raining quite heavily (good decision to erect antenna on Friday). Unfortunately the rain had worked on the ropes holding up the G5RV and with shrinkage; one end of the antenna was now laying on the ground. A quick repair and we were in business again, but with a slightly lower to the ground antenna. The Icom 7200 was installed, earth fitted so up and running by 09:20 (local). Our first contact was at 09:30 with Steve on the Mic talking to GB1SKC, St Keverne, Cornwall - the operator at the other end was Ivan, a former Chairman of the Huntingdonshire Amateur Radio Society, a great start. Once again the Society ran a Special Event Station for Railways on the Air at Nene Valley Railway, Wansford Station. Nigel G6LSB and David M0VTG arrived on site at 0700 hrs local time and erected an OCFD along the fence line of the car park. Malcolm M0OLG arrived to assist in the erection of the gazeebo and all was set for operations before 0900 hrs. Initially on batteries and with a little adjustment to the transceiver assisted by reports from Sid M0SRS and Peter 2E0PRP the final adjustment being confirmed as good from further afield by Mike G8ALS (Coventry). Propagation conditions proved to be rather variable at first but soon settled down to provide good inter G contacts for most of Saturday. Italian, German and Dutch stations were also worked. Altogether we worked 14 other ROTA Stations ably assisted by Phil G7KJW who had a good stint on the mic. The wx stayed fine but we were glad of the gazeebo as the breeze became quite strong during the day prompting us the check the forecast which predicted 35 mph gusts overnight and 2.4 mm of rain early morning. A decision was made in early afternoon to disassemble everything as the gazeebo was becoming stressed and would not last the night. The outcome was that we did not return on the Sunday. However, we worked 50 stations in total with the last 20 comprising a pile-up worked by M0VTG whilst G6LSB went to the cafe to bring back some cake. We all agreed that we had had a good day and the decision to quit left us on a high and in good spirits. We will return, no doubt, next year but M0VTG may well be in Canada at that time; some one else will have to lead. For the fourth year the special event Station GB2DWM located at Duloe Mill, Eaton Socon was setup and run by members of HARS. We had in attendance over the two days 12 Club Members as either operators or loggers on HF and VHF stations, I must add that they did not all arrive at once but came in shifts as agreed to spread the load, this proved to be a good team building exercise with plenty of banter around the station, this may have been due to the copious amounts of tea and coffee which were consumed or was it the choccy biscuits on offer! With conditions being as they were several club members brought along various radios and antennas for operation to the fact that we had nine different radios on the desks during the weekend which did create plenty of interest, discussion and head scratching when trying to locate the appropriate button or knob. All the items proved successful with QSO’s were being made when in use. Conditions were not kind to us for operating HF with only 62 contacts being logged these being into Holland, Belgium, NW France, Ireland, Germany, West Poland, Switzerland, John O Grouts Scotland, and finally Canada. Moving onto VHF were conditions proved better with 50 QSO taking place from The Peak District, North Wales, North Yorkshire and many other QSO’s within 75 miles of our location, we utilised both a Co-linear and a 10 Element VHF Yagi Beam obviously not at the same time to make these contacts and employed the Armstrong antenna rotator to spin the beam around. My thanks go to HARS for the loan of the kit and to the members who came along and fully engaged with the operation of the event and enjoyed the good weather we had over the weekend.